Websrch.mobi offers as a search engine at websrch.mobi/search. 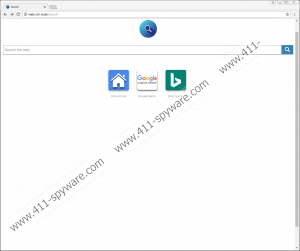 The tool was created by AirFind Corp., the company that stands behind Search.ibrowser.io, Search.browsersearch.net, and other suspicious search engines. Their interfaces are identical, and they all appear to promote three unique services: AirFind Portal, Google Custom Search, and Bing Search. Is it weird that the same company created several different identical tools with different names? It certainly is because it is not clear what the purpose behind that is. Most likely, the company is simply maximizing its opportunities to record data and promote sponsored content. Although the search engine is not classified as a browser hijacker, there are reasons why trusting it is not recommended. After analyzing it, our recommendation is that you delete Websrch.mobi, but, of course, the choice is yours. Keep reading this report and, hopefully, you will be able to make your own decisions. If things are not cleared up, add your questions in the comments area. You can easily change unwanted homepage and search provider settings, and you can learn how to do it – if you do not know it already – using the guide below. We also suggest clearing browsing data just in case. If you do that, all data tracking tools will be eliminated also. But is manual removal the best option? That depends on what is going on on your computer and browsers. Do other suspicious pieces exist? That might be the case if your operating system is unprotected. In fact, Websrch.mobi might have entered your operating system along with something else. Use a reliable malware scanner to figure out if there is anything else you should delete from your computer. If other threats are discovered, you should employ an anti-malware tool to find and automatically remove Websrch.mobi along with other questionable pieces of software. Launch the browser, tap keys Alt+F, and select Settings. In the Search engine menu Remove/Edit the undesirable provider. In the On Startup menu Remove/Edit the undesirable start page URL. Tap keys Ctrl+Shift+Delete and, first, choose the time frame. Select the data boxes you want and then click CLEAR DATA. Launch the browser, tap keys Alt+T, and select Options. Either in General or Home menu find the Homepage and then overwrite the URL. In the Search menu choose the preferred provider and then Remove the unwanted one. Select the data boxes you want and then click Clear Now. Launch the browser, tap keys Alt+T, and select Internet options. Click the General tab, move to Homepage, and overwrite the undesirable URL. Click OK. Tap Alt+T again, select Manage add-ons and then move to Search Providers. Choose the preferred provider and then Remove the unwanted one. Click Close. Tap keys Ctrl+Shift+Delete, select the data boxes you want, and then click Delete.